Don’t let the plain appearance of Shor Park fool you, there is a lot of nature going on there. Located at 4659 Tealtown Rd., Milford, OH, it is easy to miss the entrance driving by. There is a sign marking the park, and a nicely paved parking lot, but little else to draw one’s attention because it is surrounded by woods and a wetland field. Informative signs start the beginning of the trails right off the parking lot. We walked on Sunday, March 20, 2016, at 11:29 a.m., temperature was 39 degrees. 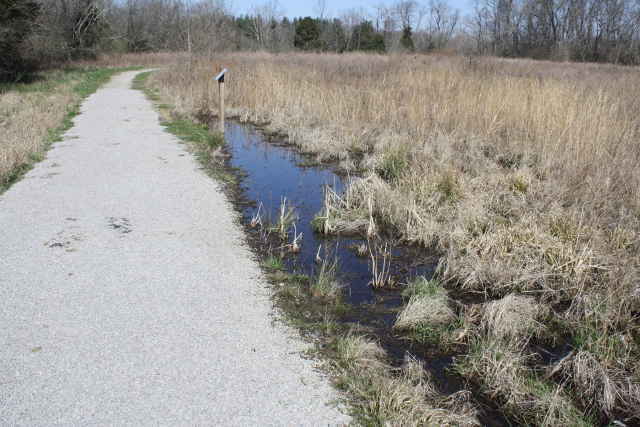 There are three trails to explore, one into the woods, and two that surround the wetland field. We walked the ‘Meadow Trail’ first that led us straight into a wooded area. 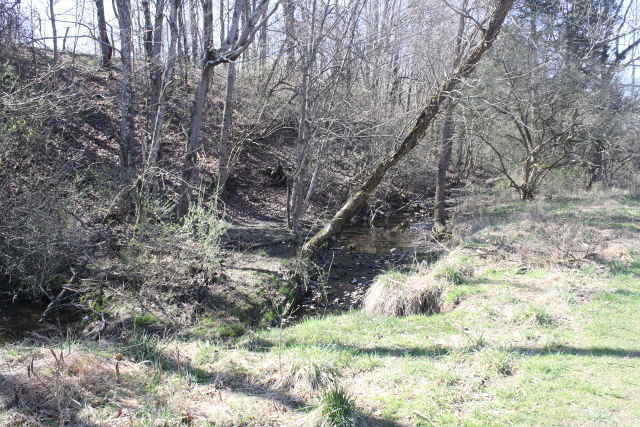 The path was gravel, and wide at the beginning, and crossed a babbling creek over a well-constructed wooden bridge. Soon after that the trail forked to each side of a meadow, where it became narrow in some places as it meandered up and down hills around the edge of the meadow, circling back to the wooden bridge. 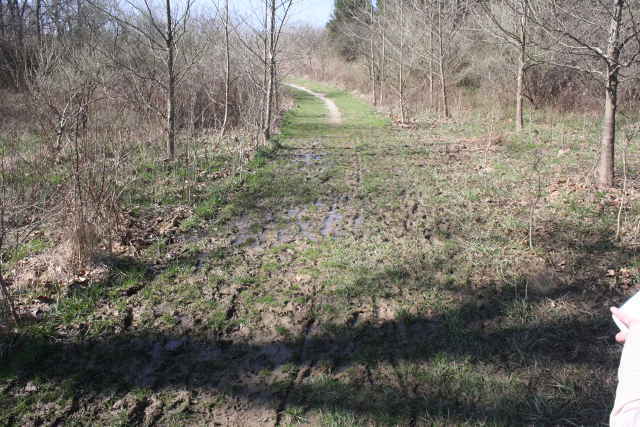 The trail was also muddy in spots as there was little or no gravel after the part at the beginning, and it measured one mile. We were immediately immersed in nature on this trail, complete with the sounds of song birds and water flowing over rocks in the creek which ran along side parts of the trail. The wooded area surrounding the path is part of a large private natural area, so there were woods as far as you could see. Next we walked the ‘Wetland Trail’ which circled a swampy field, complete with bird houses and signs telling of the natural wetland inhabitants living there, including frogs and Red-Shouldered Hawks. This trail stayed consistently wide, flat, and filled with gravel, so there was little mud. Tealtown Road was visible while walking this path, although one side is along a wooded area. There was some litter on the side closest to the road, and it measured .7 of a mile. Restrooms: There were no restrooms, not even a port-a-potty. 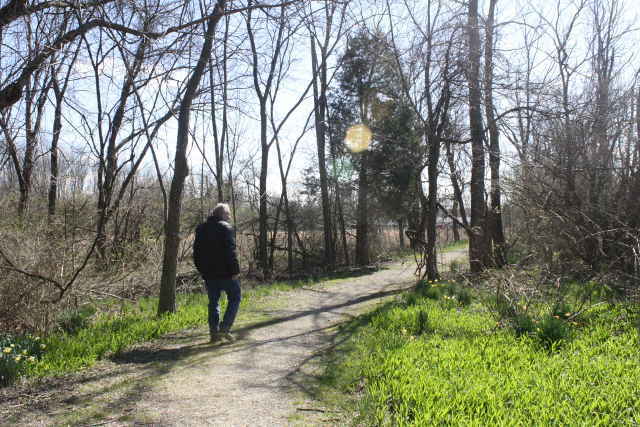 Traffic Noise: There was no traffic noise while walking the ‘Meadow Trail,’ but quite a bit on the ‘Wetland Trail,’as it was right off Tealtown Road. Interesting Features: It was an especially relaxing place to walk, as the ‘Meadow Trail’ took you straight into a beautiful natural area with no signs or sounds of civilization. The park was made for walking though, having no benches or places to sit. There were, however, large recycle bins for public use. 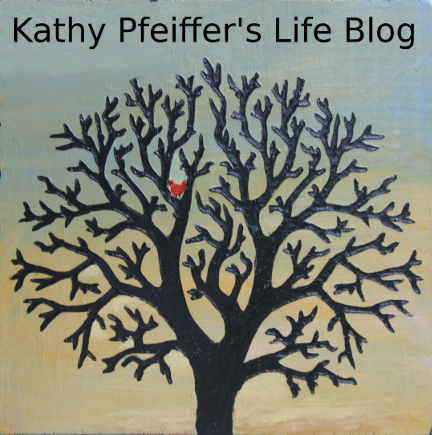 We were surprised that such a natural place existed so close to busy Eastgate, and highway 275. Historic Points of Interest: According to EPA estimates, Ohio has lost 90% of it’s pre-settlement wetland habitat. Almost all of this habitat has been converted into agricultural uses and living space. Only in the last few years has the importance of wetlands been understood, and the restoration of wetlands all over Ohio is in progress. In Shor Park, at least 10 acres of wetlands are in the process of being reclaimed. Wetlands are important for a number of reasons. They are a natural sponge, absorbing excess water and releasing the overflow slowly, mitigating the effects of floods. 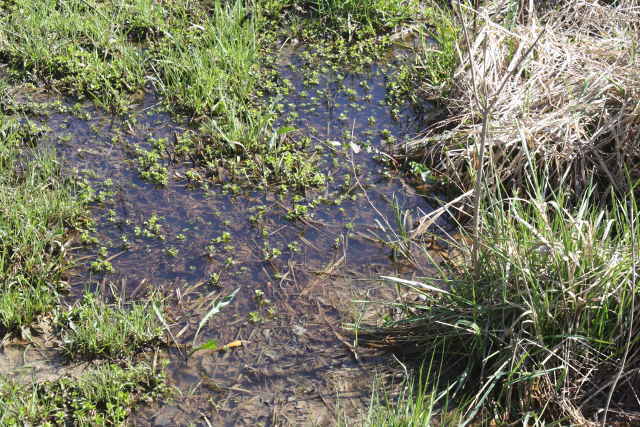 They are important for species diversity, as many use wetlands as part of their life cycle. Finally, wetlands may aid in global climate conditions as a way to take carbon out of the atmosphere. Overall Rating: We gave it an excellent rating because it was a convenient, clean, quiet place to have a quick walk into the magic of nature. It was not a park for a family picnic however, as it lacked any kind of shelter, bench, or place to sit, but that’s not why we were there. We were there for exercise and to lift our spirits as only a simple walk in nature can do. We’ve all heard that walking is good for your heart, but in BBC article, “The Slow Death of Purposeless Walking,” walking is cited as an important part of creative thinking as well, and goes on to say that people like Charles Dickens and Henry David Thoreau came up with some of their best ideas while walking. 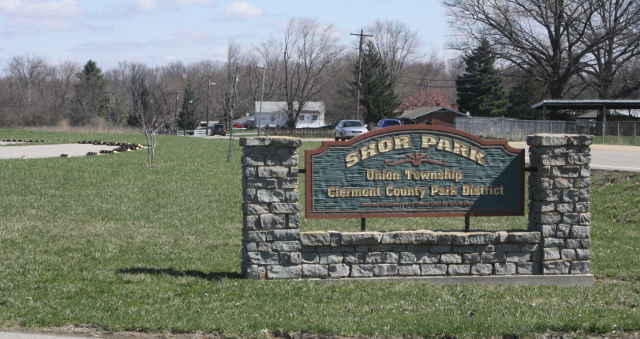 Shor Park could be just the place to take a break from our busy lives, and enrich ourselves, mind, body, and soul. Thanks! It is was great!